Mention the nickname "Mr. Christmas," and almost anyone who's not a newcomer to Windham County knows immediately you're talking about Mervin Whipple. Whipple died Saturday night at Day Kimball Hospital in Putnam. He was 81. Whipple, of Pineville Road, Killingly, gained national acclaim for the spectacular display of Christmas lights and animations he set up yearly for about 35 years at his home and business, attracting thousands of visitors. He sold the display to Millis, Mass., auto dealer Kevin Meehan in 2004. "Mervin was really disappointed when he had to shut down the display, mainly because of a lack of volunteers to help get it organized," his widow, Barbara, said Monday. "Opening that display each year was one of the most enjoyable parts of his life." 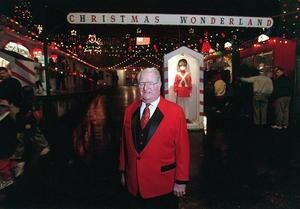 As the display grew in the 1980s and 1990s, Whipple would stand in a bright red suit jacket, at the entrance to the office of his business, Everlasting Memorials, greeting each visitor with a warm handshake and a friendly greeting for young and old alike. What many visitors didn't know was that Whipple held a small counter in his left hand, counting each visitor as they entered. He would write the daily attendance on a calendar, and would often cite those figures, running well into the thousands, in stories announcing the opening of his display the following year. He never charged admission, taking only the donations left in a container in his workshop. Ironically, the light display was born from a family tragedy, the death of his stepson from a former marriage, Edmund Bourassa. Bourassa died Dec. 16, 1967, only hours after he and Whipple had set up Christmas decorations outside their home. Prior to the accident, the two men promised they'd work together on the decorations every year. Bourassa lost his life when the body of a dump truck, filled with 10 tons of sand, fell on him as he worked on the truck. Whipple never forgot his promise to his stepson. In the late 1960s and early '70s, Whipple's Christmas decorations routinely took first place in the annual Christmas lighting contest sponsored by the Killingly-Brooklyn (now the Northeastern Connecticut) Chamber of Commerce. "After a while, they decided to make me a judge so someone else would have a chance," Whipple used to joke. Within a few years, Whipple's display had grown to where many local residents would drive by to see the display of lights. Whipple later added animated Yuletide or winter scenes to the display, many showcased in protective cases lining the walks to his business and yard. The animations also filled the showroom of his business, giving visitors an opportunity to browse through the showroom as they warmed themselves against the chilly December nights. Later, a huge screen was erected along the rear of the property that eventually held thousands of lights. By the time he closed the display in 2002, Whipple's Christmas Wonderland boasted more than 112,000 lights and more than 350 animated scenes. Bill Yonush, of Plainfield, who played Santa Claus at Whipple's for many years, called Whipple's death "a sad day for the people of this town." Yonush said he and his friend, Charles Welch, shared the duty of serving as Santa Claus. "It was such a great feeling when you saw the faces of the children light up as they came up the driveway and looked at the reindeer and other display cases and then came to Santa's little house," Yonush said. "You just felt the glow in your heart as you listened to them give you their wishes." Yonush said he once volunteered at the Christmas Wonderland at 5 a.m. in his Santa costume so there would be a live Santa on hand when "Good Morning America" did a live broadcast from Whipple's display. NBC's Al Roker also did a live telecast from the Christmas Wonderland for the "Today" show and numerous TV stations from throughout New England did features on Whipple's Yuletide extravaganza. Nick Haines, president of the Northeastern Connecticut Chamber of Commerce, said he often brought guests from other parts of the country to view Whipple's exhibit. "It really got people into the Christmas spirit," he said. Betti Kuszaj, the chamber's executive director, said the Chamber honored Whipple as its Citizen of the Year in 1986. "The entire chamber membership is saddened by his death and send our condolences to his family," she said. Putnam Town Administrator Douglas Cutler said he and his wife, Charlene, brought their young sons to Whipple's annually. "It was one of the most enchanting evenings for the kids," Cutler said. "Their eyes would open like saucers as they took in the entire display. It was equally great for us as parents as we got to share in the wonderment the kids experienced each year." Tammy Bradley, of Killingly, said her children thought they were at the North Pole when she would bring them in their younger years. "I'd tell them we were going to the North Pole and if they behaved, they'd get to see Santa as well as all the lights and moving displays," she said. "They'd want to go back several times each year." R. Wesley Hopkins, of Plainfield, supplied the horse-drawn carriage that carried Santa Claus and Mrs. Claus to Whipple's on opening night for several years. "People would be lining the back roads leading to Whipple's for some distance, taking pictures and cheering as we went by," Hopkins recalled. "It was always an enjoyable time." Hopkins also cited Whipple's work in the Grange, saying Whipple could be very businesslike one moment, and kidding with people the next. "He had a devilish sense of humor," Hopkins said. 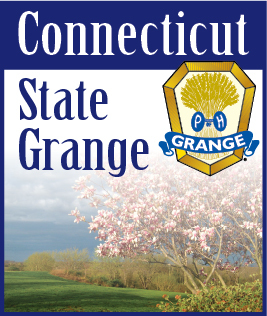 Whipple was a past State Lecturer of the Connecticut State Grange, and longtime member of Killingly Grange, where he held numerous offices. Those sentiments were echoed by Danielson businessman Walt Zadora, who said Whipple was a frequent visitor to his business, D&Z Soda King, when it was located in Brooklyn. "A lot of the kids who worked for us thought he was grumpy, but once you got to know Mervin you found out he had a soft heart, especially for children," Zadora said. Whipple also was a justice of the peace and performed more than 3,000 weddings in the small chapel that stood on a hillside behind his business. The chapel was constructed of blocks of granite Whipple had obtained from quarries throughout New England. Whipple is survived by his wife, Barbara, and two stepdaughters, Kimberly Chipman, of Brooklyn, and Barbara Salinger, of Union.